The Sydney Harbour Bridge is an iconic landmark in Sydney, Australia and is famously referred to as the “Coathanger“. It is a steel-arch bridge spanning across the Sydney Harbour (Port Jackson) and serves as the primary source of transportation between Sydney and the northern end of the harbour. First proposed way back in 1815, the Sydney Harbour Bridge was constructed in 8 years in the 1920s and early 1930s under the supervision of John Bradfield. The bridge is one of the longest steel-arch bridges in the world, spanning about 1650 feet (500 metres), and featuring four railroad tracks, a highway and two pedestrian walkways along its length. Today, more than 160,000 vehicles, 200 trains and 1600 bicycles cross the bridge every day. Moreover, it has become a focal point of tourism and celebrations. Know more about the Sydney Harbour Bridge through these 10 interesting facts. 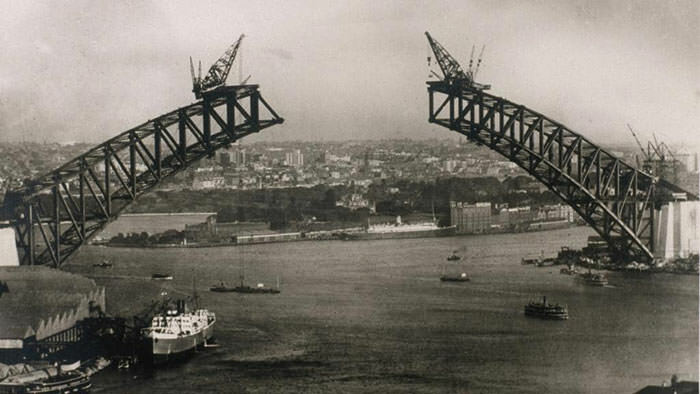 The first instance of the iconic Sydney Harbour Bridge history can be traced back to the year 1815. It was at this time that proposals to connect the North and South shores of Sydney Harbour surfaced when architect Francis Greenway proposed the plan to Governor Lachlan Macquarie. Furthermore, naval architect Robert Brindley proposed in 1840 that a floating bridge be built. In 1857, Engineer Peter Henderson put forth the first known drawing of a proposed bridge across the harbour. Moreover, a truss bridge was proposed in 1879 and a high-level bridge in 1880. Although none of these proposals materialized at their times, the idea had already struck the right chord. The need for a bridge rose to prominence since the only way to cross the harbour was to either take a ferry or trek for 12 miles around the shore. But lack of concrete plans and unavailability of the requisite technology halted the plan for about a century. In 1900, the Lyne Government famously organized a global competition for the design and construction of the harbour bridge. While the outcome of the competition could not materialize due to controversy, a local engineer Norman Selfe won the second competition by proposing the design for a steel cantilever bridge. But an economic downturn and a change of government drained his efforts in vain, halting the construction. 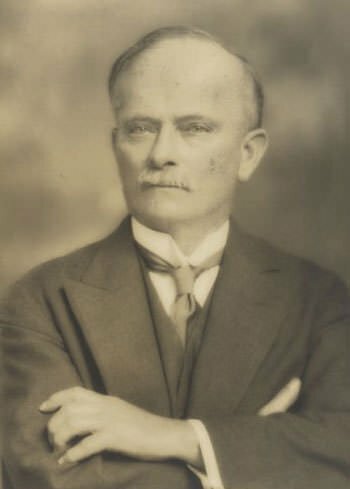 Plans to construct a bridge over Sydney Harbour surfaced again in the year 1912 when John Bradfield, a civil engineer who was working with the New South Wales Department of Public Works, put forth his ideas to the Australian parliament. He envisioned the bridge as one of two designs – a suspension design or a cantilever design. The cantilever bridge design was finally accepted and John was appointed as the project lead. But World War I interfered with the construction of the bridge and almost a decade passed before funding for the bridge was secured. As Bradfield would ultimately supervise the construction of the bridge, he is regarded as the “Father of the Sydney Harbour Bridge“. By the time the First World War ended, advancement in the science of steelmaking had made it possible to construct an arch bridge. The cantilever design was eventually discarded in favour of a steel-arch design, primarily because it was much easier to construct and was capable of handling heavier loads. An arch bridge is a bridge with abutments at each end shaped as a curved arch. The contract of building the bridge was awarded to Dorman Long and Co., a British company. 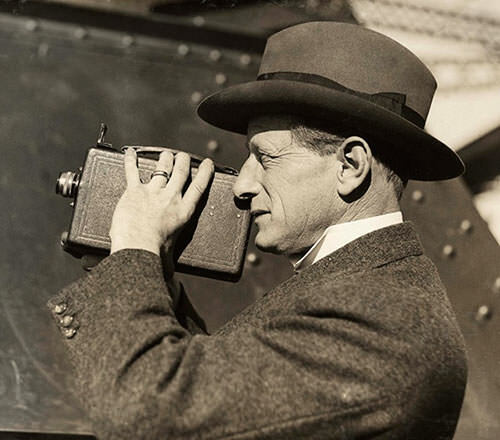 Sir Ralph Freeman, an English civil engineer, was hired to undertake the detailed design work of the structure. Construction eventually began in 1924 under the supervision of Bradfield. Bradfield came forth with the complete ideation of the bridge, but Ralph Freeman considered himself to be its true designer. Although his claim was supported by a few authorities, the controversy has not been resolved to date! The construction of the Sydney Harbour Bridge officially began in July 1923 with the “turning of the first sod ceremony“. On the other hand, the construction of the arch began in October 1928. August 1930 marked the meeting of the two arch halves and work on the deck consequently commenced. Finally, the bridge was inaugurated on 19th March 1932, taking eight years for its construction to complete. It took a total costing of $A 13.5 Million to complete the bridge and this was finally paid off for only in 1988. It is also estimated that a total of 469 buildings on the northern shore were demolished to pave way for the construction of the bridge. This included both private homes and commercial operations. 52,800 tonnes of steel, 3200 tonnes of rivets, 95,000 metre cube of concrete and 272,000 litres of paint were used in the initial construction of the Sydney Harbour Bridge. It took 1400 workers to take the bridge from ideation to completion. The lives of 16 workers were lost in accidents over the years. During the course of its construction, a total of 6 million steel rivets were manually driven into the bridge by the hands of the workers. Since all this and more involved the input of countless man-hours, the bridge earned the nickname “the Iron Lung“. Moreover, it was widely regarded as a triumph over depression times by giving employment to many depression-era workers. 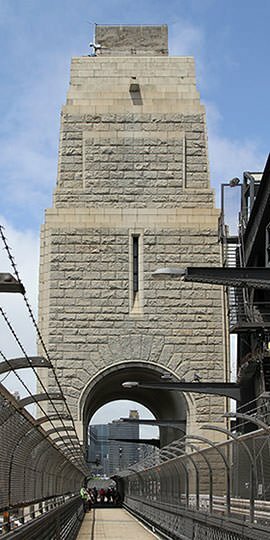 Each end of the arch of the Sydney Harbour Bridge is marked by the presence of a pair of high concrete pylons that are faced with granite. A total of 18,000 cubic metres of granite was quarried by around 250 Australian, Italian, and Scottish stonemasons to construct the pylons. It is interesting to note that all this effort was originally made to add to the aesthetic value of the bridge. It was not until recently that the pylons were finally put to use. The south-eastern pylon consists of a museum and a tourist centre along with a 360-degree lookout at the top. 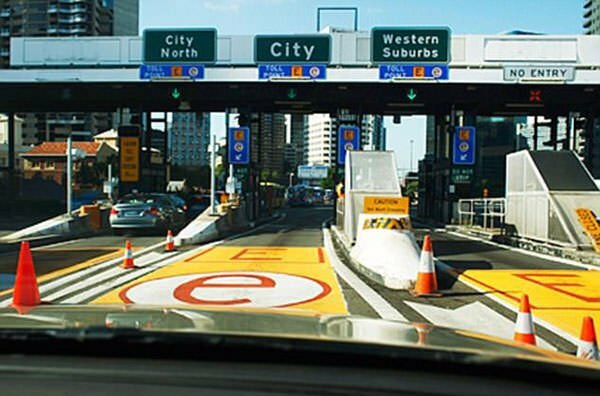 On the other hand, the New South Wales Roads and Traffic Authority uses the south-western pylon to support the CCTV cameras that overlook the bridge. The north shore consists of two pylons which comprise of chimneys to vent the fumes from the Sydney Harbour Tunnel. The base of the southern pylon consists of the RMS Maintenance shed for the bridge. Lastly, the base of the northern pylon comprises of the traffic management shed for tow trucks and safety vehicles. With a length of 1419m (3770 ft), Sydney Harbor Bridge is the sixth longest spanning-arch bridge in the world. It is also the tallest steel arch bridge with a height of 48.8m (160ft). Until the construction of Port Mann Bridge in Vancouver in 2012, Sydney Harbor Bridge was the world’s widest long-span bridge with a width of 48.8 m (160 ft). 79% of the steel that was used in the construction of the bridge was imported from England and only 21% came from Australian sources. The foundations of the bridge are 39 feet (12 metres) deep and set in sandstone. The anchoring tunnels are 118 feet (36 metres) long and dug into the rock at each end. The arch of the bridge consists of hinges at either end, bearing its whole weight. The hinges play a pivotal role since they allow the vast structure to move, especially when the steel expands and contracts in response to changes in temperature and wind speeds. The Sydney Harbor Bridge features four railroad tracks, a highway and two pedestrian walkways along its length. More than 160,000 vehicles, 200 trains and 1600 bicycles cross the Sydney Harbor Bridge every day today (2010 statistics). In 1932, this number was about 11,000. At the time the bridge opened, the initial toll for a car was 6 pence (5 cents), and 3 pence (2 cents) for a horse and rider. Today, the toll stands at $3 dollars. Majority of this fund is utilised to cover the maintenance of the bridge that amounts to a whopping $5 million per year! Moreover, painting the bridge is a never-ending task with approximately 80,000 litres (21,000 gallons) of paint being required for every coat. While some parts last up to 30 years, others have to be painted every 5 years. Contrary to usual policies, the city promotes climbing the sides of the Sydney Harbour Bridge as a leading recreational activity. This is led by professional guides and the bridge is amply equipped with all the requisite climbing and safety wear. It is also possible to trek to the top of the bridge for a breathtaking view of the city. 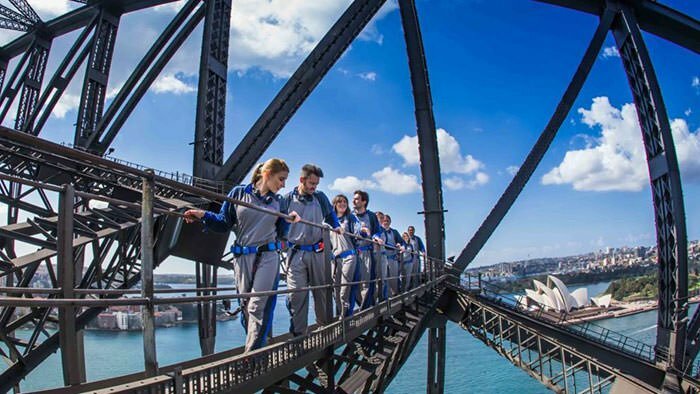 The prerequisites for the popular “Sydney Harbour Bridge“ climb are being at least 8 years old and over 1.2 m tall. Climbers are promptly provided with a blue jumpsuit that consists of all the necessary safety gear. Depending on the fitness level of the climbers and their preferences, there are quite a few options for them to choose from. These include: BridgeClimb Sampler, takes 1.5 hours to ascend to a spot that is halfway through the top; BridgeClimb Express, involves ascending through the inner path of the arch and takes 2.5 hours to complete; and BridgeClimb Original, involves ascending four ladders through the outer arch of the bridge and takes about 3.5 hours to complete. Over the years, the bridge has attracted countless tourists and hosted numerous celebrations. To begin with, the bridge is a crucial part of Sydney’s annual new year’s celebrations, especially as a focal point of spectacular “Sydney Harbour Bridge fireworks“ shows. During the Sydney Olympics in 2000, the bridge was embellished with Olympic Rings and was included in the route of the Olympic Torch. Moreover, in 2005, Sydney Harbour Bridge was involved in the promotion of Formula One as Mark Webber drove a Williams BMW Formula One car across it.